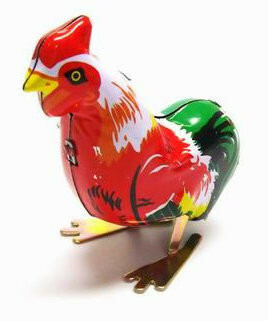 A colourful, wind-up, pecking rooster tin toy. Height 8.5cm. A colourful, wind-up, pecking rooster tin toy. Please note: These toys are for adult collectors only and are not suitable for children to play with. They are made of tin and may contain some sharp edges.